KYIV, Ukraine—Thousands of protesters massed in front of Ukraine’s parliament building Tuesday, underscoring a simmering level of frustration among Ukrainians—particularly the country’s war veterans—with the slow pace of anti-corruption reforms that has persisted since the 2014 revolution. According to initial estimates, Tuesday’s protests drew about 6,000 people. The chief rallying cry was a demand to strip Ukrainian lawmakers of their judicial immunity from prosecution; a fixture of Ukrainian law that many say promotes corruption among government officials. Speakers leading the protests enumerated their demands to the applause of the gathered crowds. Apart from rescinding lawmakers’ judicial immunity, the demands also included the establishment of anti-corruption courts and electoral reforms that would diminish the influence of oligarchs. Yet, the driving forces behind Tuesday’s protests were more deeply rooted than those bullet point demands. 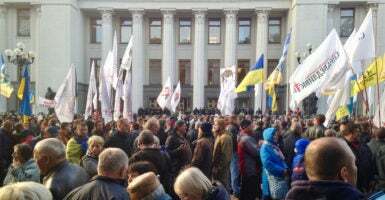 The number of protesters, and the high percentage of combat veterans among them, underscored the brewing disappointment among many Ukrainians with the outcome of the 2014 revolution. Recent polls, for example, suggest an overwhelming majority of Ukrainians think that life has gotten worse since the 2014 revolution. 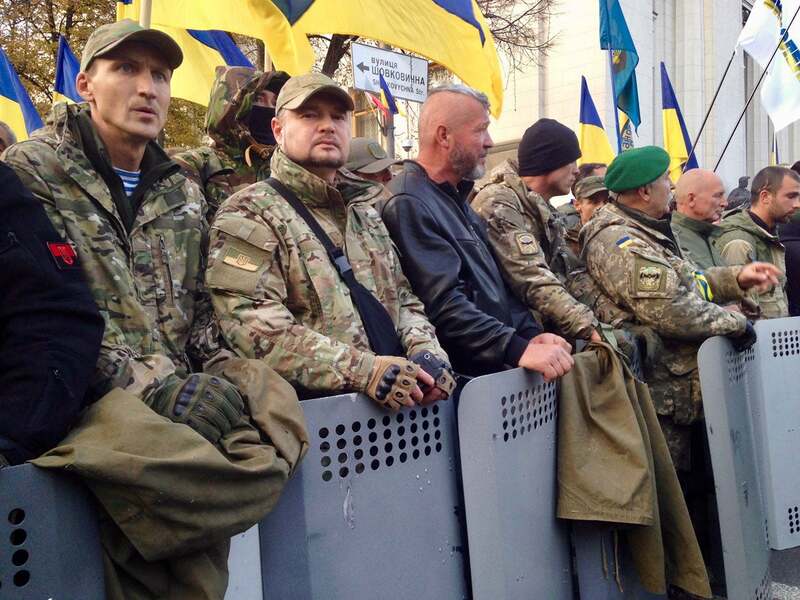 Members of the Donbas Battalion, a National Guard unit, among the protesters on Tuesday. On Aug. 31, 2015, four Ukrainian National Guard troops were killed during protests in front of Ukraine’s parliament when a protester—a war veteran—tossed a hand grenade into the police line. That lethal incident still has law enforcement personnel on edge. Consequently, Tuesday’s protests brought the government quarter of central Kyiv to a standstill, reflecting concerns among Ukrainian officials that the protests outside of parliament could ignite more widespread anti-government uprisings. According to government officials, about 500 police officers and National Guard troops were deployed to guard the parliament building on Tuesday. 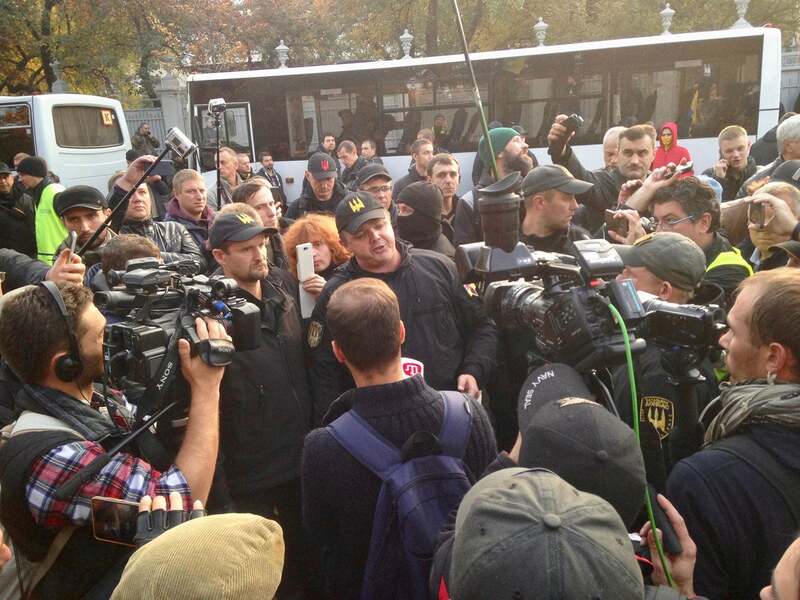 Mykhaila Hrushevskoho Street, which runs in front of parliament, was overrun with protesters for blocks. The road—normally clogged with bumper-to-bumper traffic on a weekday afternoon—was sealed off at either end of the gathered crowds by metal police barricades. Protesters stopped traffic Tuesday on a street adjacent to parliament. 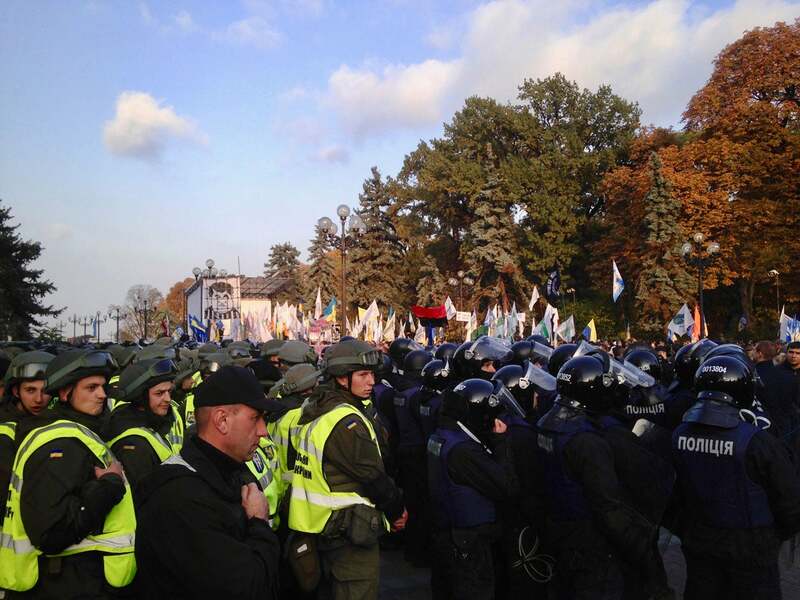 A few blocks away from parliament on both Heroes of the Heavenly Hundred Street and on the parallel Liuteranska Street, hundreds more police and National Guard personnel stood guard in front of the dual entrances to the presidential administration building. And in the surrounding city streets for blocks in different directions, police officers and National Guard troops stood in small groups, concealed in alcoves and archways. A member of the Donbas Battalion speaks to the media outside Ukraine’s parliament on Tuesday. Some protesters, even those wearing balaclavas, were taking selfies. Some flashed peace signs, or gave a thumbs up. Others seemed to be digging in for a sustained presence, setting up tents on the adjacent road and in nearby Mariyinsky Park. “I believe that peaceful manifestations are an important element of democracy, and I understand and respect their participants,” Ukrainian President Petro Poroshenko told a Ukrainian news program on Tuesday. However, around 4:00 p.m. one police officer was wounded in a melee with protesters, according to Ukraine’s Ministry of Internal Affairs. The age of the protesters ranged from young to old, and included men and women. Among them, there were many military veterans from the ongoing war in eastern Ukraine—where Ukrainian military forces have been engaged in combat against a combined force of pro-Russian separatists and Russian regulars since April 2014. Russia invaded and annexed Ukraine’s Crimean Peninsula just weeks after the 2014 revolution. Not long thereafter, Russian special operations forces and intelligence units launched a proxy war in Ukraine’s southeastern Donbas region. The war still simmers as a static, frozen conflict, with no serious chance for a durable peace deal on the horizon. Russia’s proxy war in eastern Ukraine has, so far, killed more than 10,100 people, and displaced about 1.7 million more from their homes. 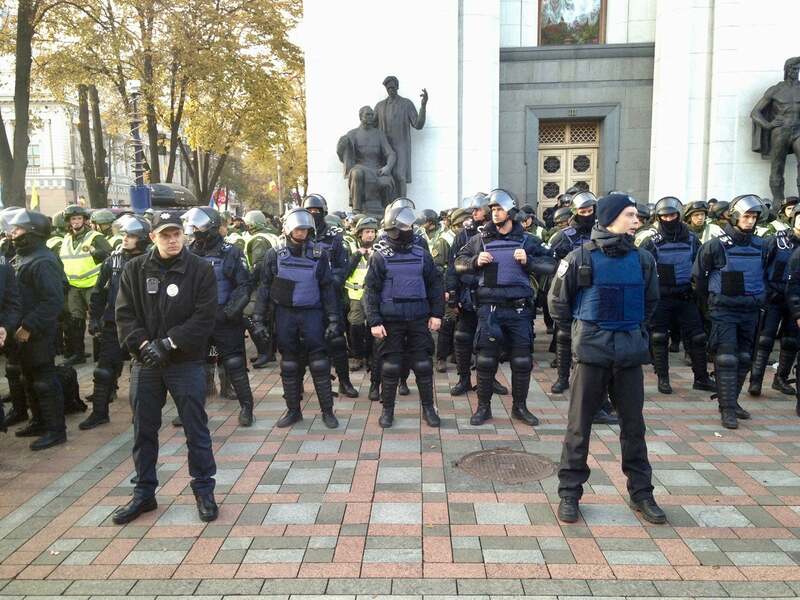 About 500 Ukrainian police officers were deployed to stand guard Tuesday in front of parliament. In the wake of the revolution, Ukraine’s war effort initially diverted the energy of its most patriotic citizens away from focusing on reforms. Now, after more than three and half years of combat, the war is stuck in a sustainable if still lethal limbo as a frozen conflict. Consequently, the war effort no longer monopolizes Ukraine’s political conversation, and reformers are increasingly able to zero in on fighting government corruption. Combat veterans are playing a key role in that rekindled anti-corruption push. Among the protesters were dozens of members of the Donbas Battalion—one of the civilian militias that were key to Ukraine’s early war effort and were later incorporated into the National Guard. 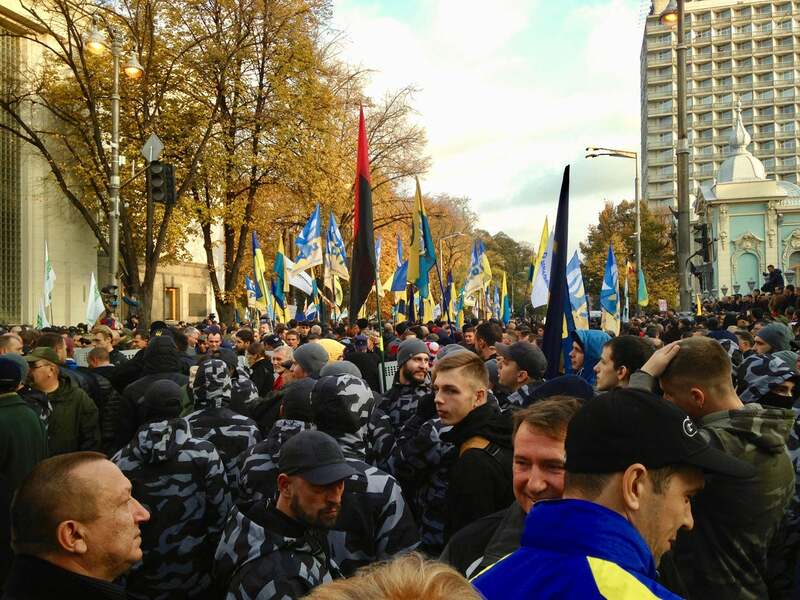 Many of the Donbas Battalion members at Tuesday’s protests wore military uniforms. They marched in lockstep holding a line of steel shields. The prolific presence of military veterans at Tuesday’s protests highlighted how Ukraine’s political landscape might change as tens of thousands of combat veterans cycle out of military service commitments and return to civilian life. 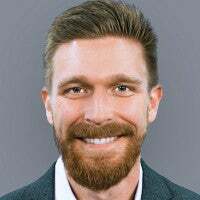 One line of thinking is that returning veterans who become politically active will be more aggressive in holding elected leaders to account for their post-revolution promises. Recent polling suggests that many Ukrainians think their lives have gotten worse since the 2014 revolution. 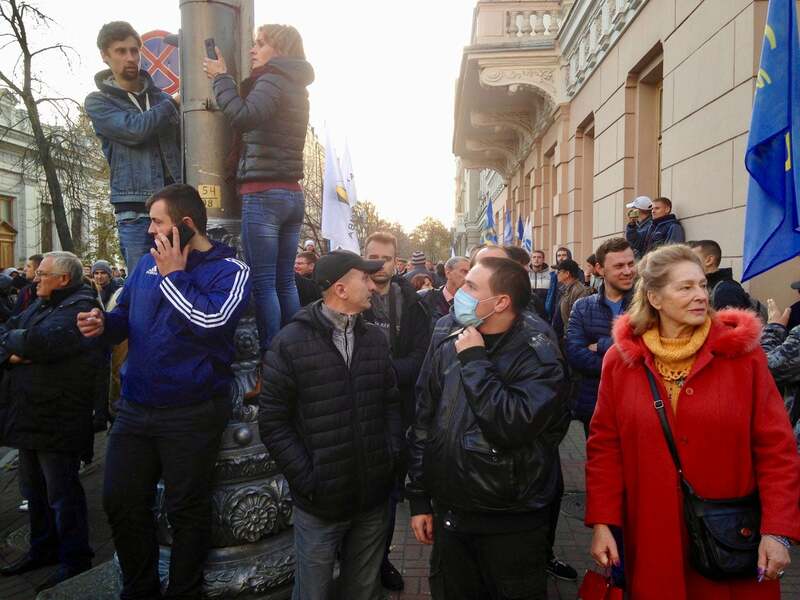 At times on Tuesday, the protesters chanted “revolution.” Once, a speaker on a bullhorn led the crowd to chant “Maidan” over and over—referring to the 2014 revolution that overthrew Ukraine’s pro-Russian former president, Viktor Yanukovych. “The revolution begins today,” a Ukrainian regular army war veteran named Andrey said on Tuesday. He asked that his last name not be published due to security concerns.